Heat oven to 375°F. Line large cookie sheet with Reynolds® Parchment Paper. In medium microwavable bowl, place butternut squash and 2 tablespoons water; cover. Microwave on High 6 to 8 minutes, stirring once, until tender. 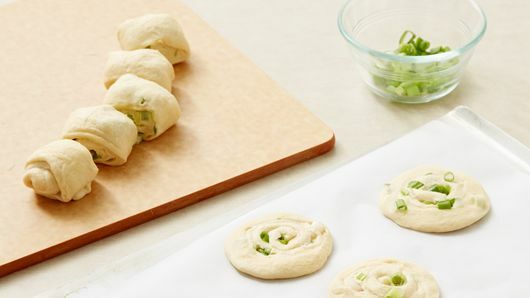 Meanwhile, reserve 4 teaspoons green onion for garnish and 1/4 cup green onion for dough. Spray 2-quart saucepan with Crisco® Original No-Stick Cooking Spray. Add remaining green onion; cook over medium heat 4 to 5 minutes, stirring frequently, until softened. 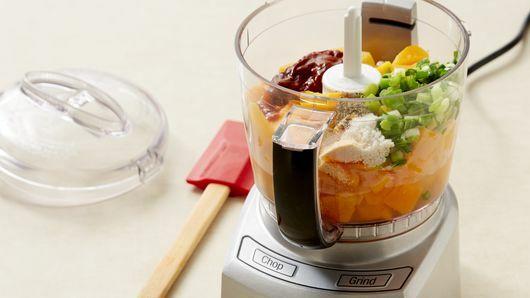 In food processor, place squash, cooked onions, 1/2 teaspoon of the garlic powder, 1/2 cup of the chicken broth, the chipotle chile and adobo sauce, 1/2 teaspoon sea salt and 1/4 teaspoon pepper. Cover; process until smooth, 1 to 2 minutes, scraping sides occasionally. Pour squash mixture into saucepan; add remaining 1/2 cup chicken broth. Heat over medium heat, stirring frequently, until hot. Stir in whipping cream. Cook uncovered over medium heat 4 to 6 minutes, stirring occasionally, until heated through. Meanwhile, unroll dough; press to form 12x8-inch rectangle. Sprinkle remaining 1/4 teaspoon garlic powder and 1/4 cup reserved green onion over dough. Starting at short side, roll up dough; pinch edges to seal. Cut roll into 8 slices; press each slice to form 3-inch round. Place 2 inches apart on cookie sheet. Sprinkle with 1/8 teaspoon sea salt. Bake 9 to 13 minutes or until golden brown. Immediately remove from cookie sheet to cooling rack. To serve, spoon soup into 4 serving bowls; top each with 1 teaspoon reserved green onion. 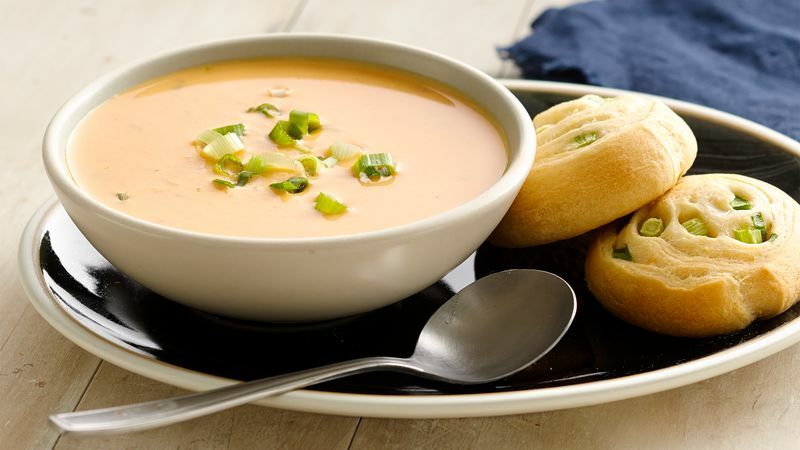 Serve soup with warm crescent rounds.